This set of watercolour, flower clipart is full of the bursting joy of spring, with pastel, blush hues that evoke the feeling of spring transforming into summer, with the bleach bright sun rays turning everything a paler shade. I was imagining a floral set that is perfect for your summertime projects, especially spring/summer wedding suites. You will receive a set of individual flower and leaf watercolour illustrations, which have been scanned and carefully removed from the white paper background. These botanical illustrations with transparent backgrounds can then be arranged and layered however you wish to create your desired outcome. The flowers and leaves are accompanied by some pre-designed elements such as wreaths, frames and bouquets, which match the elements perfectly. Also included, are embellished letters and numbers to add even more options for your designs. 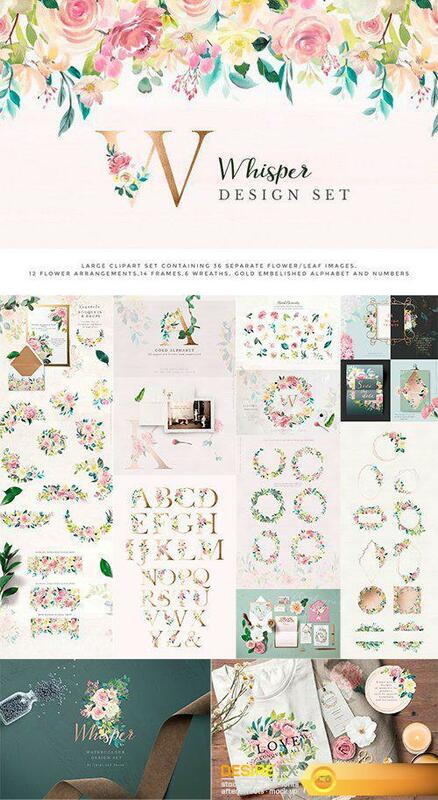 This set would work well for a variety of projects including wedding stationery, greeting cards, apparel, branding and logo design, blog graphics and instagram / social media designs.